It has been ages since I posted a monthly favorites! It is not that I don't have any favorites but I am pretty much overwhelm by so many products I tried and time had envy me much, in result I don't have time to blog about it. I think it was last year since my last monthly favorites. What the *beep*. So gladly I got more time now since I am working at home. Now let see what I have been loving for the past month. For a hasty person like me. Something that takes a few seconds to use are just what I need. I got this sunscreen together with the essence type last month. I also have reviewed it in a single post, you can read it here. What I like about this sunscreen is that, it comes in a spray bottle. How awesome is that. The mist that it dispense out are very fine and does not choking me out like deodorant spray used to make me. It is not wet and it is very very fine. I use it after I apply my moisturizer like a finishing spray as well as all over my arm. It retails for RM42.30 and you can get this at your local pharmacies such as Watson, Guardian and many more. A very lightweight moisturizer than comes in a convenience squeeze tube. Leave my skin matte and not greasy for the whole day. Definitely a most reach day moisturizer during the month of June. No overpowering scent and just simple as it is. You can see my full review here. I am obsessed with this palette. I am planning to do a full review on this! It is the Natural Eyes Eyeshadow palette from Too faced. Comes in a very cute compact case that has all the colors I need. Pretty much obsessed with the shade Cashmere Bunny for my brows. I use the shade Push Up, Silk Teddy & Chocolate Martini religiously for my eyeshadow and I use Nudie to contour my nose. Basically all the shades I am loving are in a one palette. The texture is creamy and smooth. Oh can't wait to do a full review in this! This retails for RM129 and you can get it at any Sephora near you. Hands down. Best concealer ever. 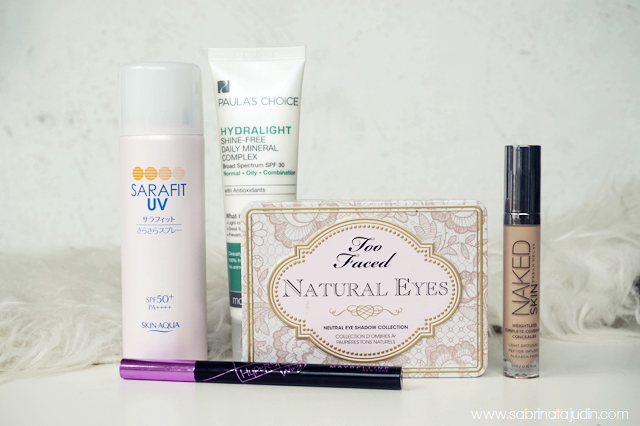 Remember I blog about my first ever high end concealer? Which is the Tarte Maracuja Concealer? It was my first ever splurge on a concealer after years depending my my favorite drugstore concealer. I was losing hope as I am wasting money on a concealer because that one does not turn out good. But there's hope. There is a concealer worth spending on and it is this. This is actually my 2nd tube. My first tube were given for PR purposes and after fell in love with it, I use it till the last drop and could not help my self to buy another one. This is so convenient. Normally I would just use this and use powder. I'm good to go. Will do a full review on this too! This retails for RM108 and you can get it at any Sephora near you. Just after I got a parcel from the PR, I open up the parcel and I saw this. I immediately try it on the same day. Since then I have been loving this eye liner! It is by far better than what I have been saying the best eyeliner I had tried. It is thinner, easier to control and more pigmented. Will review this one too soon! This retails for RM39.90 and available at your local participating pharmacies that carries Maybelline products. Well that's all for my past month favorites! 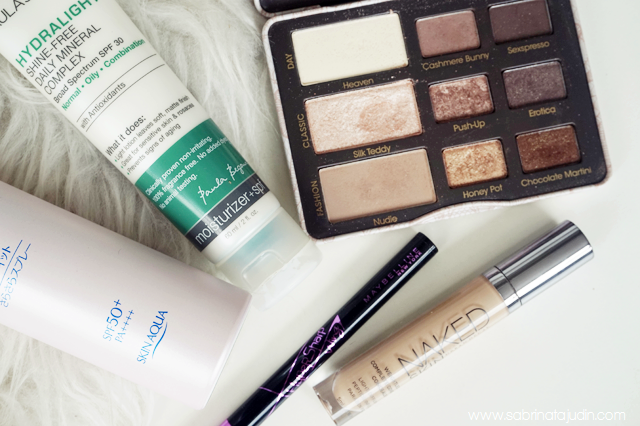 Basically since I stayed home I just use simple makeup and these are my essentials. Inspire by Arrisa D where she features her favorite song in her monthly favorites. I am featuring my favorite song for the last month. The song that I have been replaying over & over again - Of course, it is Bad Blood by Tay Tay! *singing* Oh my fan girling over and over again on the music video. BEST MUSIC VIDEO EVA! T_T I saw the Hypersharp Liner Wing Edition for RM10 some time ago at Guardians but I didn't pick it up because I just bought myself a Stila eyeliner..
And a lot of people has been raving about the Too Faced natural eyes palette lately.. hmm.. hasn't it been out for quite a while already? Looks very buttery and gorgeous though.